Wondering where to eat in Seville? Not only will I share my favorite local spots below, I’ll also tell you the 20 must try foods in Seville so you can be sure to order well in this foodie paradise! Seville is the city that captured my heart quickly. I fell in love with its narrow streets, its tiny bars, and its stunning Cathedral– and, of course, with its amazing food. I greatly admire the devotion of the locals to their city; they’re obsessed (and rightfully so) with its festivals, climate and cuisine. I still envy their unwavering belief that they live in the best city on earth! My years spent living in Seville were wonderful, filled with frequent tapas crawls, bike rides on the river and midnight strolls through the illuminated reminders of Spain’s golden age. And in the midst of my love affair with Seville, I left. I desperately needed to break out of my comfort zone, and moving to Madrid by bus (in two trips) was certainly one way to do it. With a determined now-or-never mentality, my move inspired me to fall in love with another Spanish city, to start this blog, and to start my food business in Spain. Me leading one of our new Devour Seville food tours. 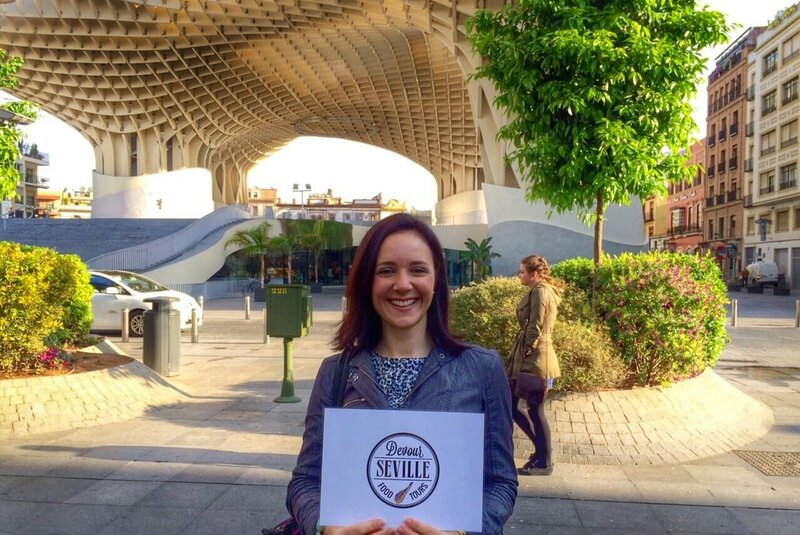 And now, nearly four years later, I was thrilled to have the opportunity to return to Seville as we excitingly launch our Devour Seville Food Tours (in April, 2015). Moving back to the city where I first fell in love with Spanish cuisine (and also with my husband!) has been a wonderful experience. I’m constantly looking at Seville in a new light, curious about each and every building (being a tour guide does this to you! ), and as excited about the city’s history as its future. While investigating for our new Seville food tours, I thought there would be no better time to finally publish my guide to eating in Seville. I’ve been wanting to write this guide for years now, but writing about a city that claims over 3,000 tapas bars is quite the task. I’ve kept my list of recommendations for eating in Seville as short as possible, knowing that most of you have only a few days to enjoy this incredible city. Hopefully, by the end of your time here, it will inspire you as it did me. Perhaps you’ll even return as I do, time and time again! The food scene in Seville is simply unrivaled. The self-proclaimed tapas capital of the world has so much to offer a food lover, and you could live here for years and still have more to discover. From traditional abacerías (tiny grocery stores that often serve wine, cheese, and charcuterie), to traditional tapas bars, to some of Spain’s most inventive and modern cuisine, Seville is a city with a bit of everything and rarely disappoints. The prices are low and the quality is high, and as long as you know where to go and what to order, you can’t really go wrong. Here’s where I come to help– this guide will tell you what to eat in Seville, and later where to eat in Seville. I hope you enjoy! What are tapas in Seville? It’s important to know that the definition of tapas varies greatly throughout Spain, but in Seville they have what I’d consider the perfect system (and the best tapas!). These are simply three serving sizes of the same dish. 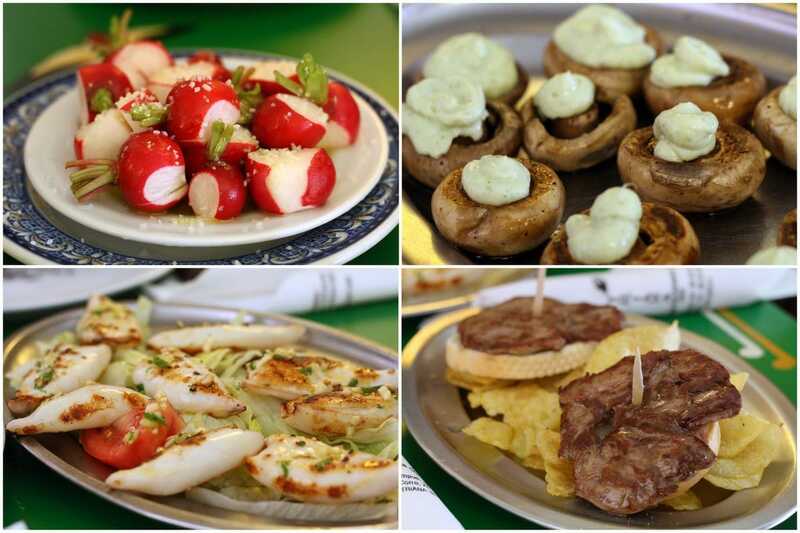 Media raciones and raciones are meant to be shared, and tapas are generally individually sized, although many people share a few tapas among close friends or family. In Seville you pay for your tapas, unlike in some other cities such as Granada or even Madrid. But this means that you have full control (which I prefer) and the quality is much better than the majority of restaurants offering free tapas. Of course it all depends on the place you choose! Tapas prices in Seville range between 1.80€ for something simple at a traditional tapas bar (such as a tapa of cheese, or potato salad) to around 3.50€. At more modern tapas bars the prices may go up to 6€ for a tapa, but generally this implies an expensive product (bluefin tuna or grass fed beef, for example) and expert preparation. Don’t rush your tapas experience. Tapas tend to come out quickly, and it’s not uncommon (or a negative thing) to hear a microwave ping. Many tapas are prepared in advance and reheated when ordered. 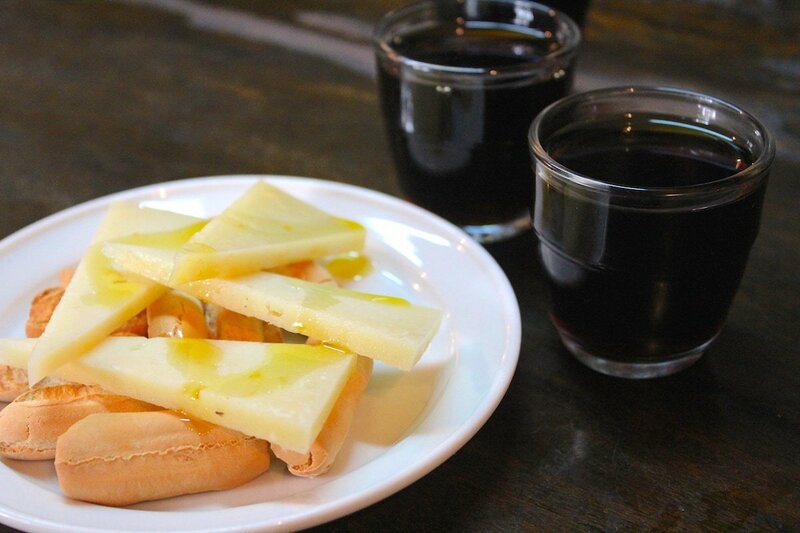 The best way to enjoy tapas in Seville is to order little by little, pairing each tapa with a drink. This ensures you won’t over order and you’ll be able to enjoy everything while still hot! Tapas with an expert: As I love both Seville’s tapas and its history, I couldn’t separate the two! 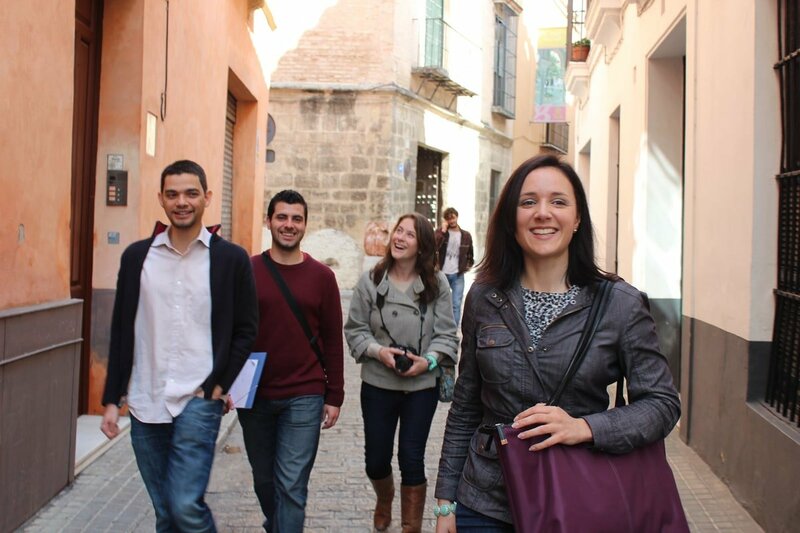 You can join my company, Devour Seville, on the 2-in-1 Tapas, Taverns and History Tour for a fantastic evening out! I’ve tried to narrow this down— some foods I love eating in Seville didn’t make the list, but here are the traditional foods from Seville that you should aim to try while here! We try nine (or more!) of Seville’s signature dishes (including some tapas) on our new Seville food tours (while we also learn the history of Seville’s culture and cuisine). I’d love to have you along! You can’t leave Spain without gorging on the best Spanish jamón (especially my fellow Americans who can’t bring it back to the US!). 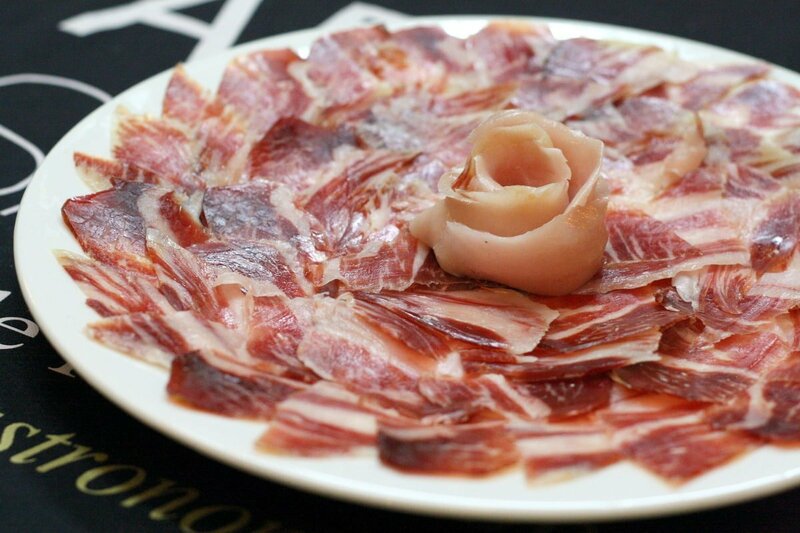 The best of the best is acorn fed Iberian ham, jamón ibérico de bellota. Seville is only a short drive from the province of Huelva, where they produce some of the country’s most flavorful and delicious ham. If you can’t make a day trip to a town like Aracena, at the very least you must fill up on ham while in Seville! Delicious Iberian acorn fed ham from Huelva. Sevillanos adore fish and seafood in all shapes and forms, and are especially partial to a well seasoned plate of fried fish. 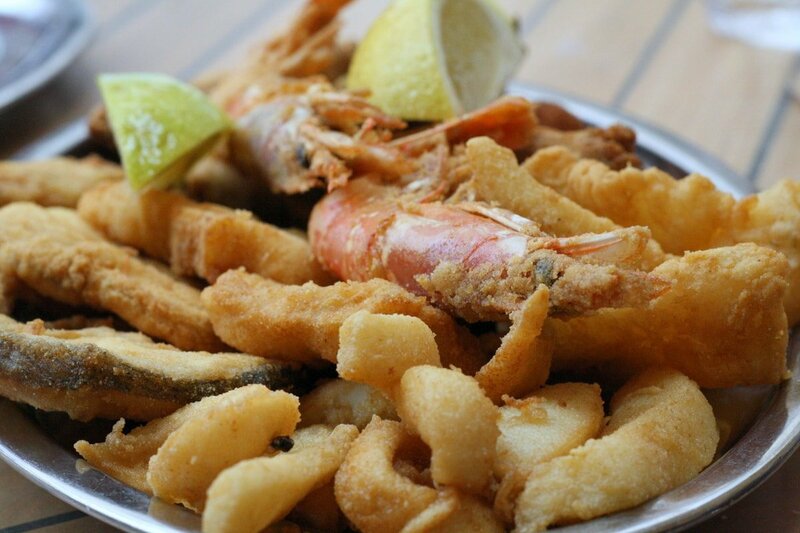 There are all sorts of fried fish on offer, best served at a freiduría (a snack bar that specializes in fried fish). Once a poor mans dish, carrillada is slow cooked cheek— either pork cheek (carrillada de cerdo) or beef cheek (carrillada de ternera). 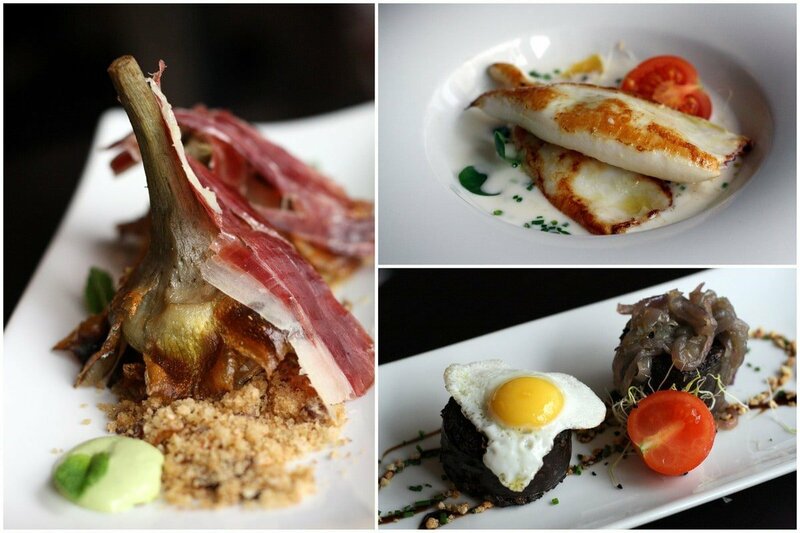 Now found on all the best tapas menus around town, it’s a worthy choice for a delicious and hearty tapa. Get my carrillada recipe here! Sherry wines are some of the most fascinating in the world. Only produced in the tiny Sherry triangle (about an hour away from Seville), Andalusia is the place to indulge. Manzanilla is the driest of sherry wines (along with fino) and has a saltiness to it from its contact (through the aging barrels) with the ocean breeze. 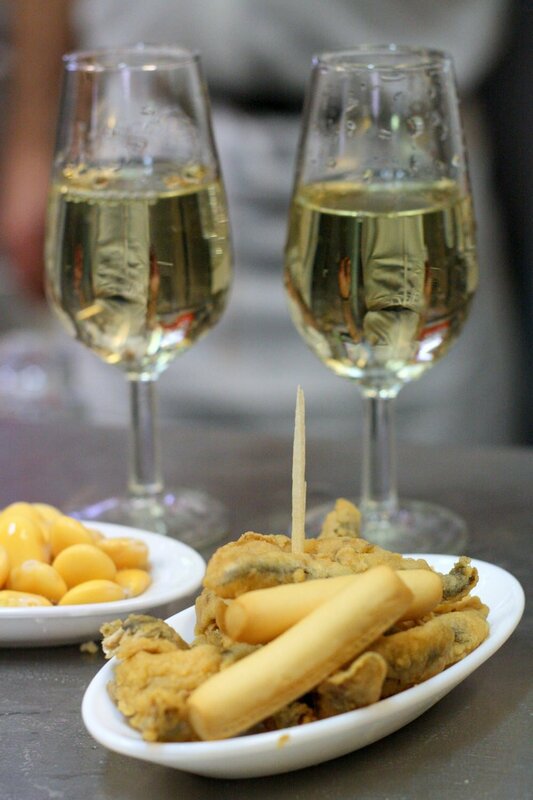 Manzanilla pairs perfectly with Seville’s salty fried almonds, jamón ibérico, and plenty of other traditional tapas. A mix between french toast and bread pudding, these delicious sweets are generally served around Easter (Holy Week/Semana Santa) but are sometimes found year round served as a dessert. In Seville you can find a few different varieties, but the classic ones are either soaked in honey or in milk with cinnamon and sugar. Get a torrijas recipe here! Three different types of torrijas for Easter week. 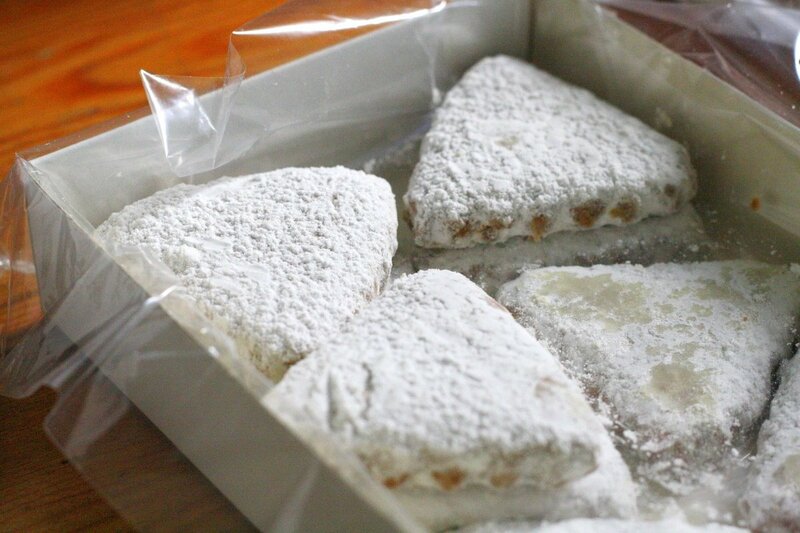 Seville has over 15 different convents where the nuns bake sweets. Click here for information and hours for each convent. Some convents specialize in only one sweet, while others have a long list of delicious pastries and cookies on offer. Tempting cookies baked by nuns. 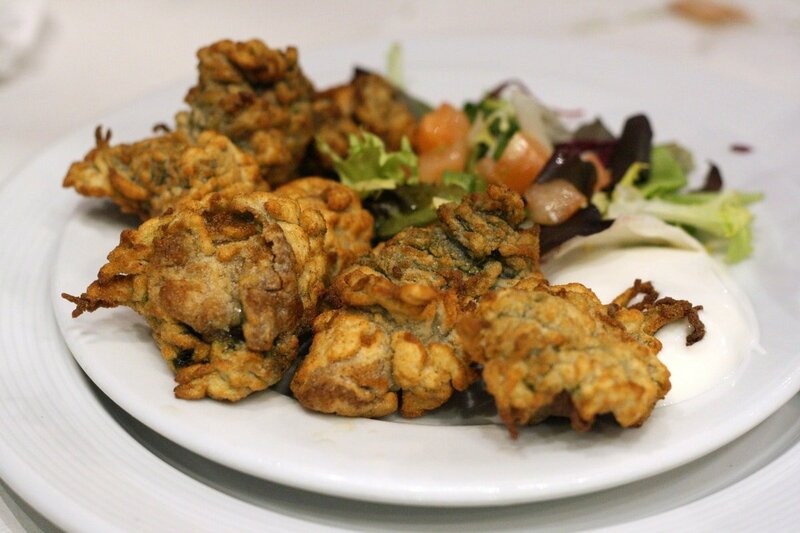 Deep fried sea anemone is not for the faint of heart. But this delicious and unique food is hard to find outside of Andalusia and a true delicacy. 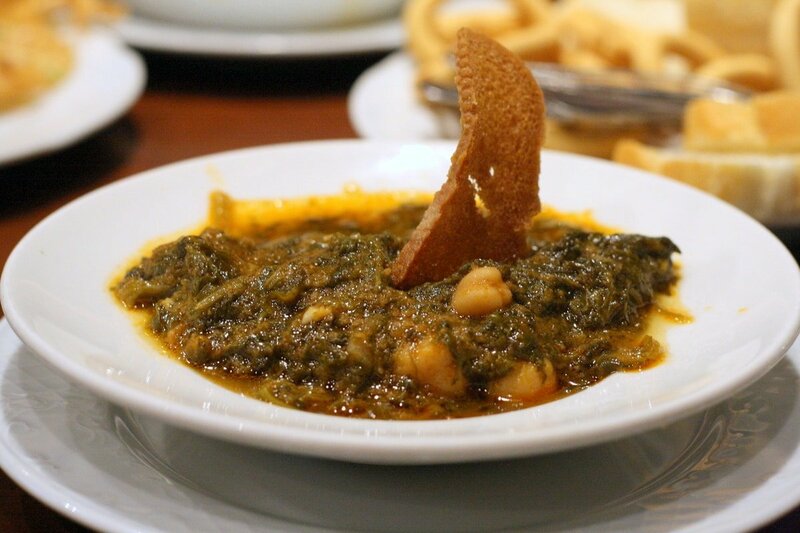 This spinach and chickpea stew is clearly influenced by the Moorish history of Seville. Heavily spiced with plenty of cumin, it’s a comfort food for many locals. Here’s my recipe for espinacas con garbanzos— a slightly more modern version than what you’ll find in Seville. Savory spinach and chickpea stew. 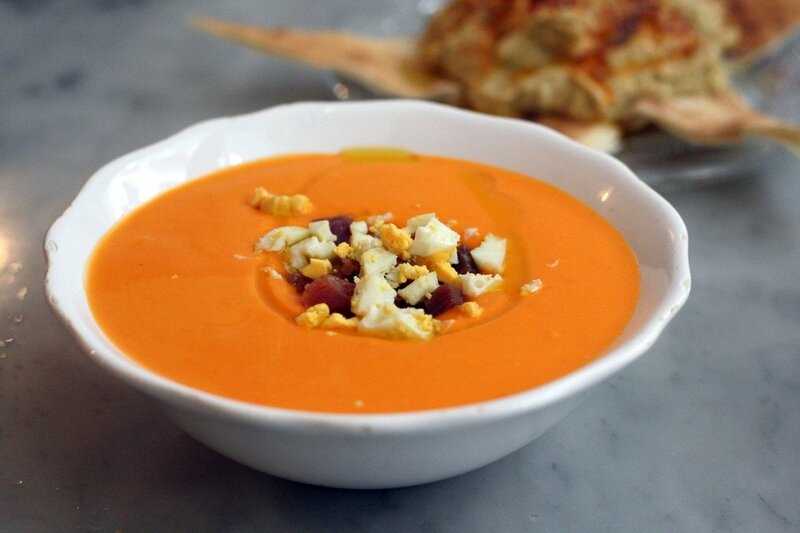 There is nothing better on a hot Seville day than a cold dish of salmorejo. A cold tomato soup, I like mine the classic way topped with hard boiled egg and plenty of jamón. See my salmorejo recipe here! Seville is home to one of Spain’s most beautiful bull fighting arenas, and the local markets always have at least one butcher who specializes in bull meat. Whether you try carne de toro (stewed bull meat) or rabo del toro (stewed bull tail), it’ll likely be delicious. 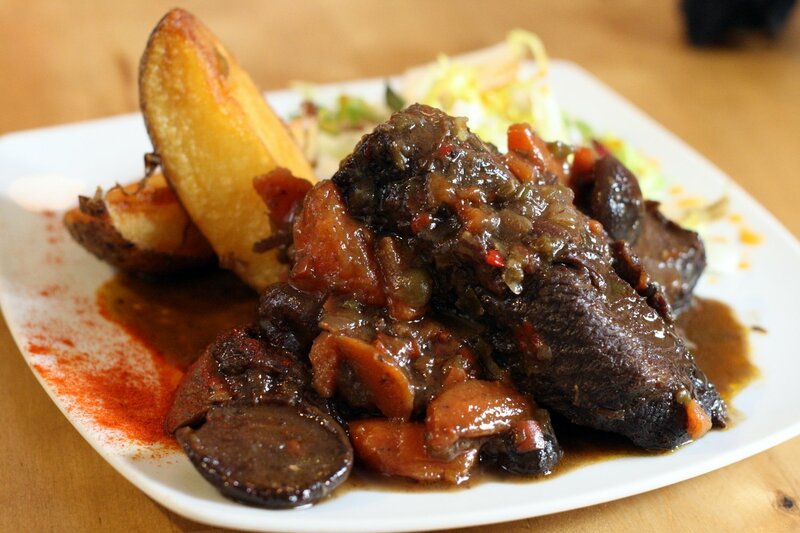 See my rabo de toro recipe. 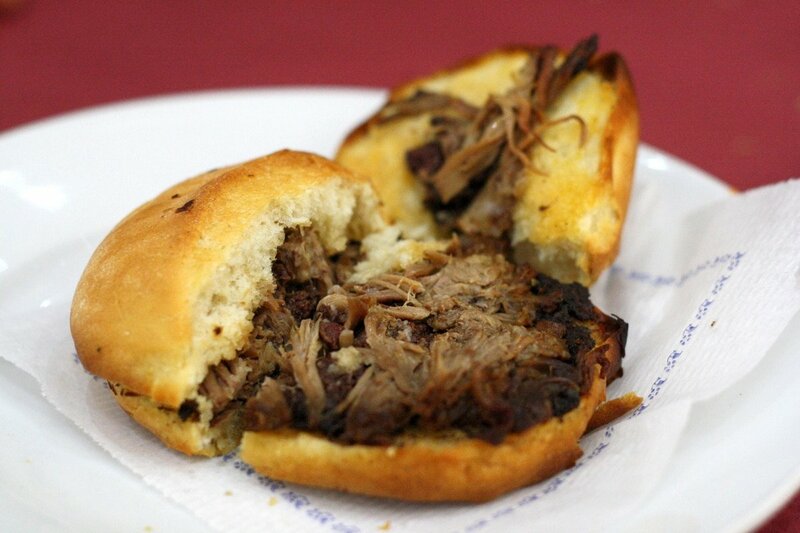 Montaditos are small sandwiches that make the perfect snack with a cold glass of sherry or a beer. 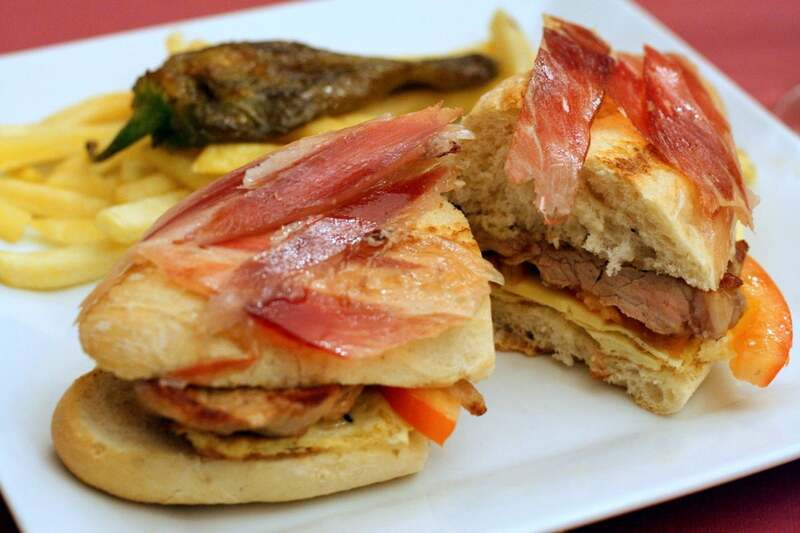 There are all sorts of versions to be sampled around town, for a list of some of the best check out this article about Seville’s best sandwiches. We aren’t quite sure how Seville’s whiskey sauce became so famous, but it’s the sauce of choice for pork loin tapas all over the city. Garlicky and delicious, everyone has their favorite place to dig in. 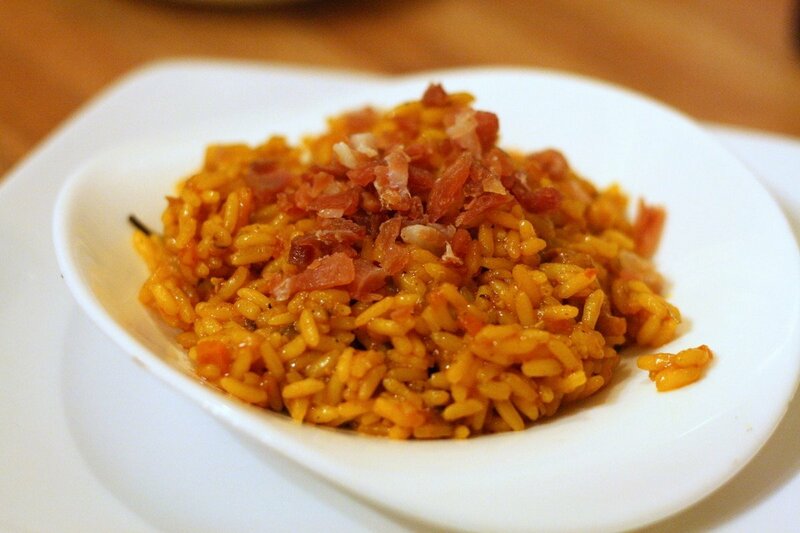 One of Seville’s best tapas– solomillo al whiskey! Some call it the best beer on earth (most likely they’re born and bred Sevillanos…) and others call it the worst. You be the judge. Bars in Seville pride themselves on serving their local tap beer ice cold (the tap is often frozen). On a 40°C day (104°F), I have to admit it tastes pretty good. 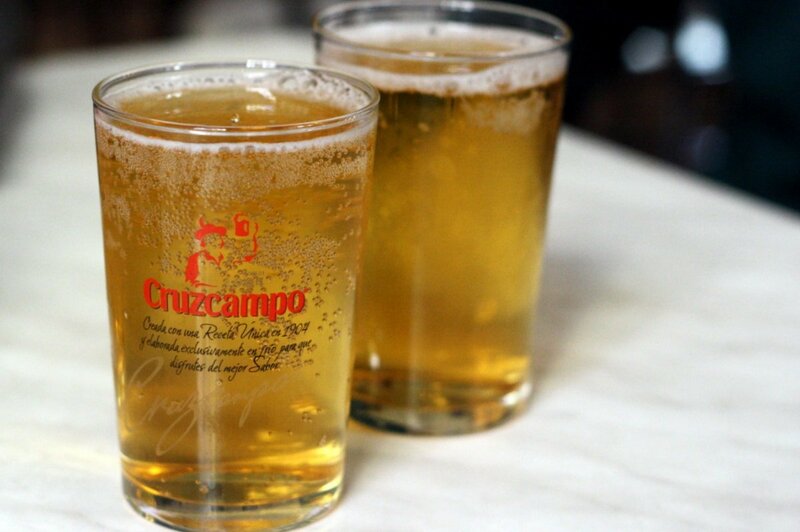 Cold Cruzcampo– yes or no? 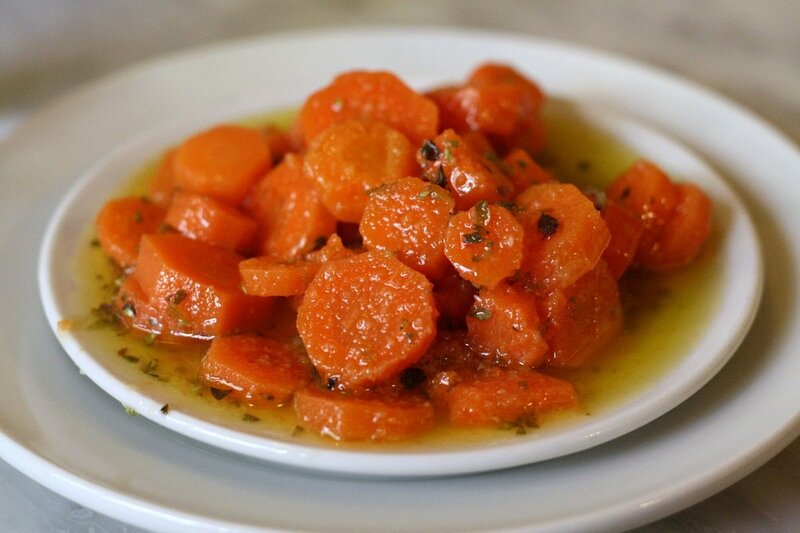 One of the first tapas I fell in love with in Seville were marinated carrots. Another Moorish inspired dish, these pickled carrots are marinated in sherry vinegar, and spiced with cumin and oregano. Then they’re smothered in the best quality extra virgin olive oil. Just try them! See my recipe for zanahorías aliñadas here! Before tomatoes were introduced to Europe by Spanish conquistadors (they were a food brought from the Americas), Spanish favorites like gazpacho and salmorejo didn’t exist. 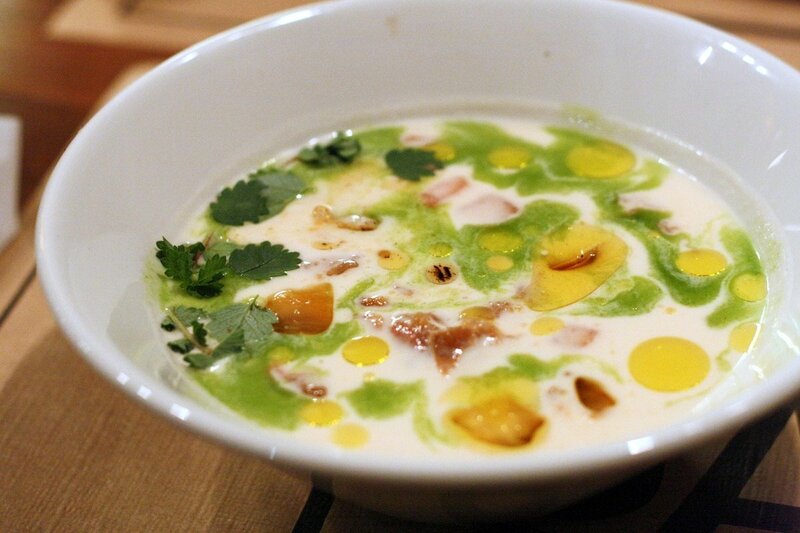 What they ate instead is called ajo blanco, and is a delightful cold soup made with garlic and blanched almonds. Lucky for us, it seems to have made a comeback in some of Seville’s best restaurants, where you’ll find it topped with delicious delicacies like grilled prawns or chopped grapes and tomatoes. Get the ajo blanco recipe! Amazing ajo blanco with toppings. 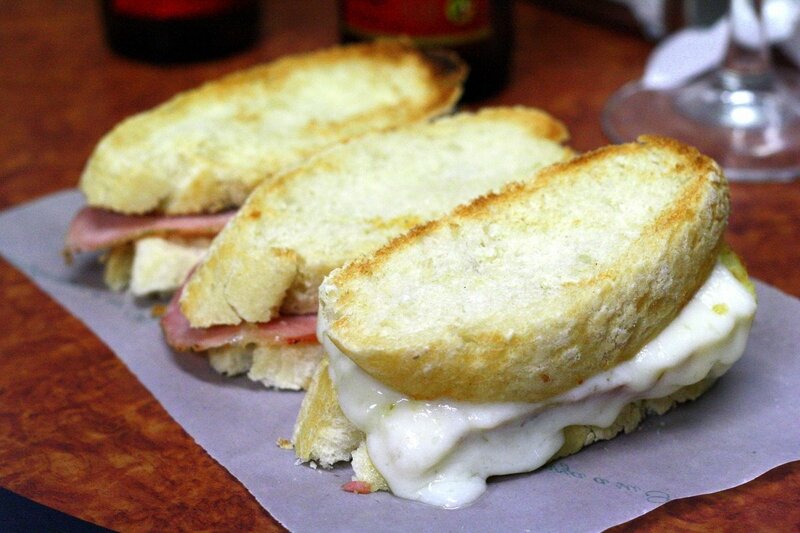 Everyone in Seville has their favorite place for a pringá sandwich. 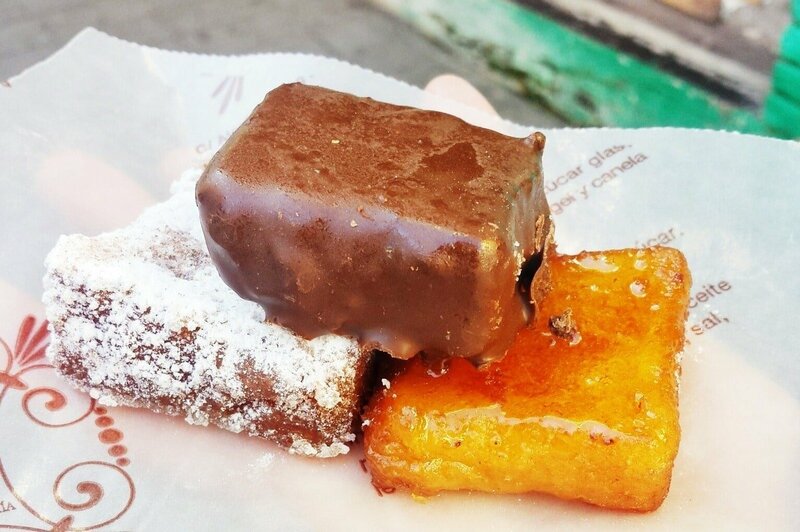 Pringá is quite possibly one of the most delicious foods in Seville! A sort of spread made with the leftovers of a traditional pork-based stew, everyone makes their pringá slightly different. I love mine with plenty of fatty pork bits, chorizo and a good amount of morcilla (blood sausage). Again– just try it (and thank me later!). Seville’s gift to the world: pringá! One of the juiciest and delicious cuts of Iberian pork, the first time I tasted secreto ibérico I actually had no idea what I was eating. I’d never had such flavorful pork– didn’t even know it existed! Secreto Ibérico is a cut that comes from just below the ribs, so it’s marbled with melt in your mouth fat that makes you smile. The most amazing cut of Spanish pork– secreto ibérico. 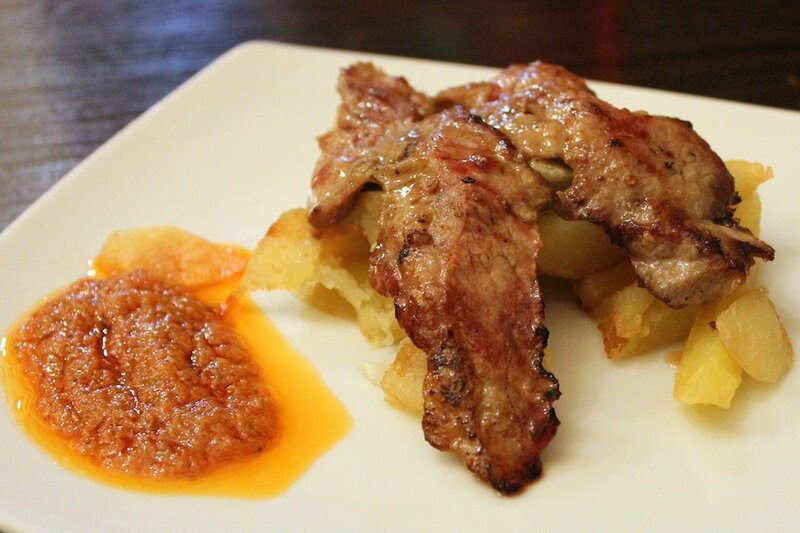 Another of the most prized cuts of Iberian pork, best-cooked medium rare and served simply. Seville’s signature sandwich (and one of my favorites ever), is called the serranito. Pork loin, Serrano ham, and a roasted green pepper combine for a delicious combination. Some places even add tomato, egg and alioli, and others offer a chicken substitute instead of pork. Invented by a woman named Ines Rosales in the early 1900s, these olive oil crackers are usually eaten with coffee for breakfast or a snack. The company has now grown to sell more than 12 million of the packages worldwide, and have introduced a variety of flavors apart from their signature sugar and aniseed. 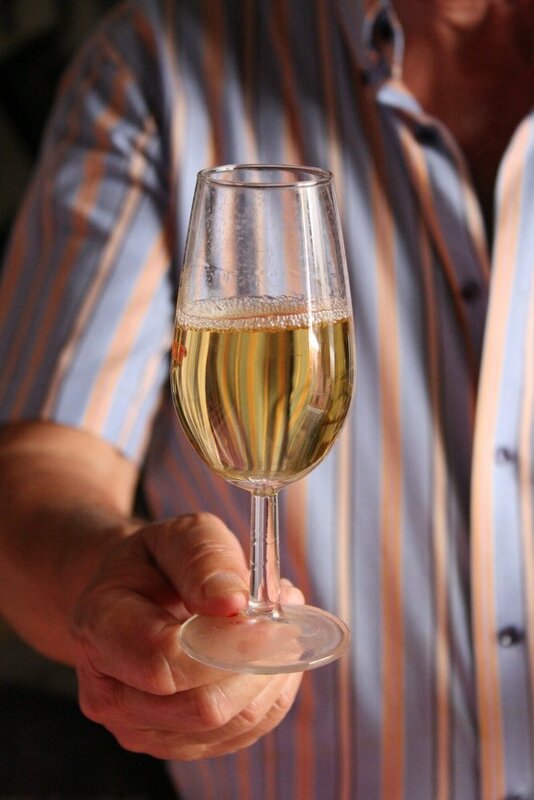 Orange wine sounded pretty terrible to me when I first heard about it, but it was love at first sip. It’s a sweet fortified wine, but the bitterness from the orange peel it’s infused with makes it delicious. Perfect with some cured cheese. Delicious orange wine and Manchego cheese. A city with 3,000+ tapas bars isn’t easy to narrow down! But here are 27 places I consider fantastic— choose a few and you can’t go wrong! Known to many as the best tapas bar in Seville, this tiny classic bar has kept their prices very low and the quality high. You can reserve a table (which is recommended because it gets packed). 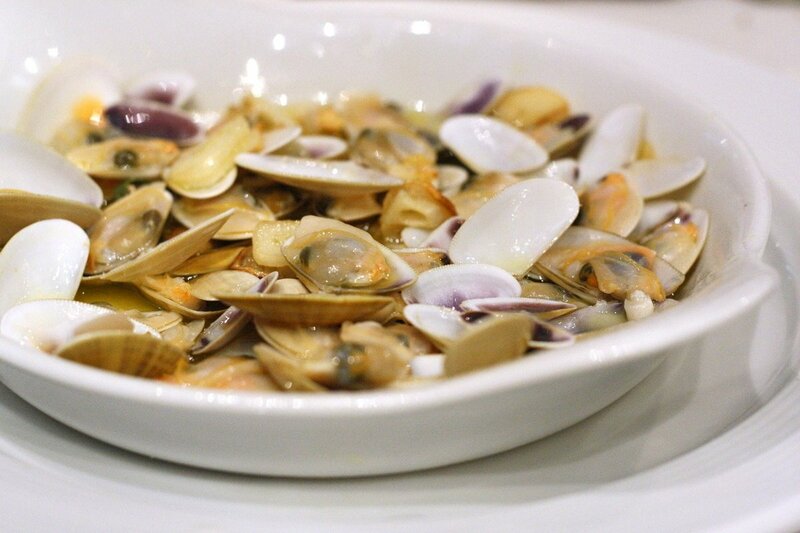 They do great seafood, especially coquinas (tiny clams) and fried ortiguillas (sea anemone). The quintessential Seville tapas bar loved by locals and tourists alike, Bodegas Dos de Mayo offers an enormous menu and cheap prices. Things do get a bit chaotic, but just go with the flow! 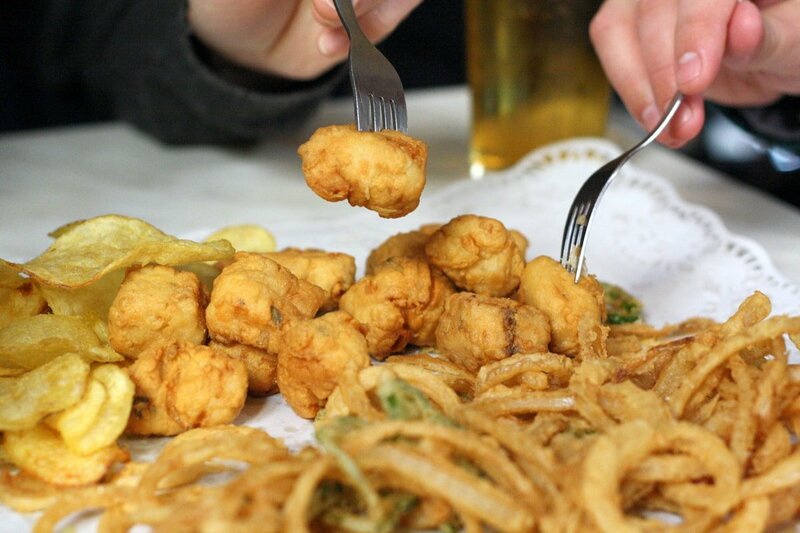 Make sure to be assertive when ordering, and order only one or two tapas at a time. I love the breakfasts at La Cacharerria, but expect to wait a long time to enjoy them. Often understaffed, you truly have to be in a relaxed mood to enjoy coming here. But, if patient, you’ll be rewarded with home baked bread and marmalades, sweet freshly squeezed orange juice and great coffee. One of the most classic bars on the border of the Santa Cruz neighborhood (and only a stone’s throw from the Cathedral), it’s one of the most popular place for tapas– especially montaditos. They do a great serranito sandwich and a respectable pringá. One of the city’s best spots for more modern tapas, La Azotea has multiple locations but I stick to their original bar on Calle Jesús del Gran Poder. The menu is constantly changing depending on the season, and you can instantly tell there is true passion in the kitchen. I prefer eating in the bar area where you can always order tapas portions and see a bit behind the scenes. Some of La Azotea’s delicious food. A delicious husband and wife owned and operated tapas bar with great food and a respectable wine list. It’s a tiny place and often highly ranked on Tripadvisor, so get there early! One of my favorite places right off of Plaza Alfalfa, this small and unassuming tapas bar serves some wonderful food, and the prices are unbeatable for the quality. They also have craft beers and a good variety of wines by the glass. 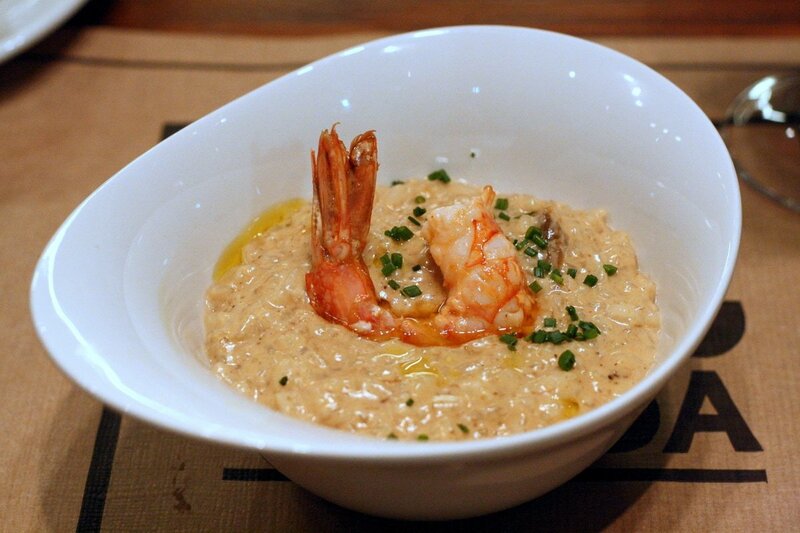 A delicious mushroom and prawn risotto tapa. A great place to reserve a table, this innovative restaurant serves up modern and delicious tapas and raciones in a lovely space. A small restaurant with about eight seats at the bar, this is definitely a place to reserve if you want a sure thing. The food is well worth it, and everything is prepared with lots of love. 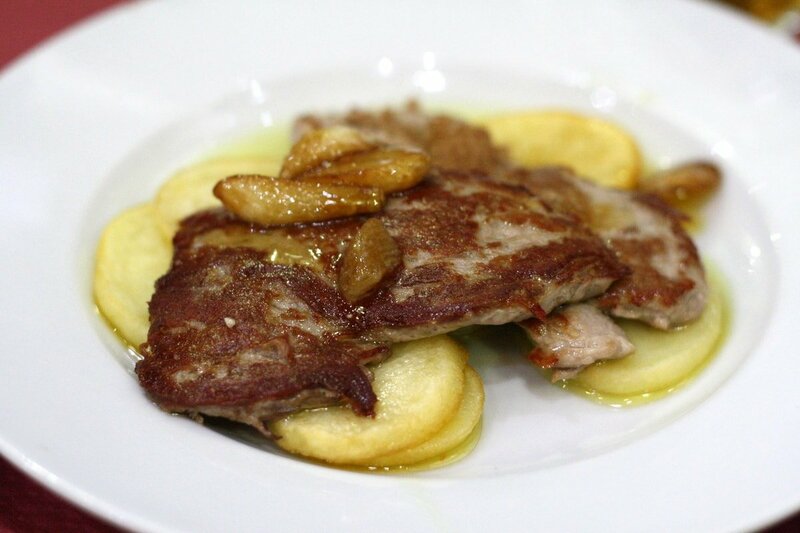 They serve one of my favorite dishes in Seville (yes– in Seville! 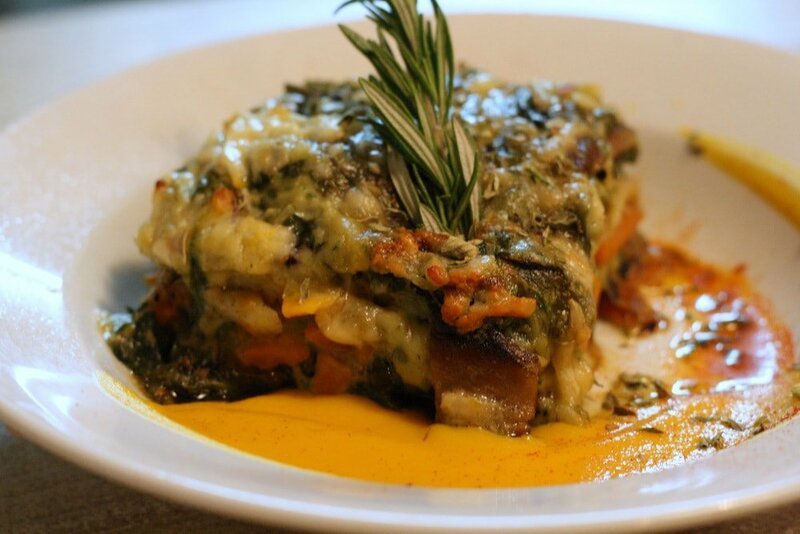 ), a vegetable lasagna. Sounds a bit boring, but it is truly remarkable– I’d work for them for free in exchange for the recipe! The most incredible vegetable lasagna. Another of my favorite tapas bars in the city center, Bar La Moneda serves seafood tapas (at the bar only). They’re known for their sopa de galeras (mantis shrimp soup!) and I adore their fish in manzanilla wine sauce. 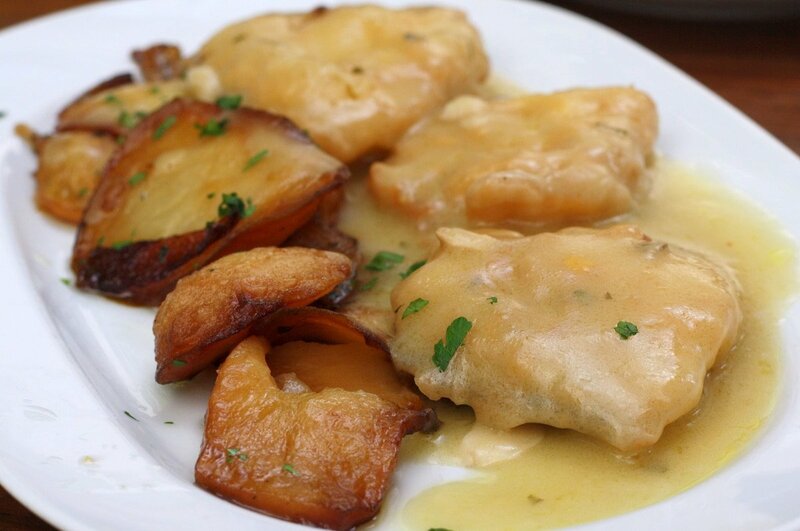 Delicious fish in manzanilla sauce. For pastries there’s no bakery more picturesque than La Campana. Known for traditional Spanish pastries and seasonal Seville sweets, their window displays are absolutely stunning. The best churros in Seville definitely come from Bar Comercio. Try them for an early morning breakfast or an afternoon snack. Another of the city center’s most popular breakfast spots, Bar La Fresqui is where you’ll rub elbows with the locals who crowd in each morning to enjoy their tostada (I get mine with jamón, tomate y aceite) and a hot cup of coffee. 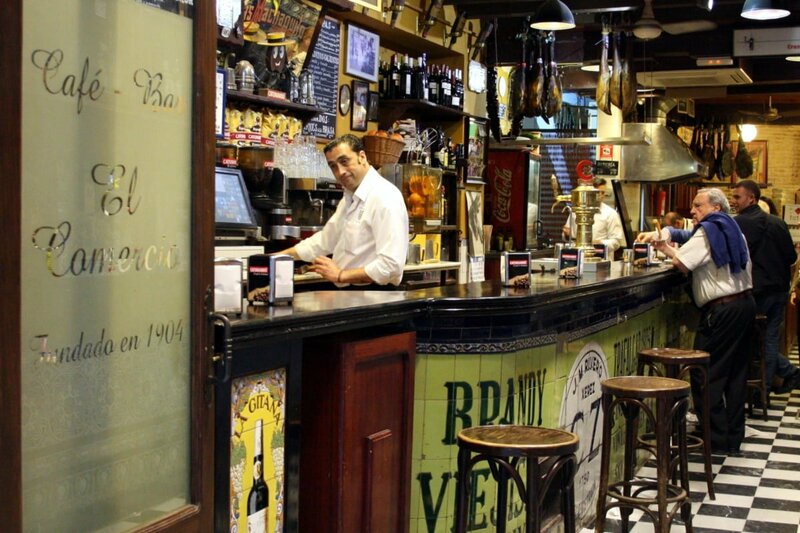 One of Seville’s best classic tapas bars, this comfortable spot makes one of the Seville’s best pringá sandwiches. It also does delicious spinach and chickpeas, and great secreto and presa cuts of Iberian pork. 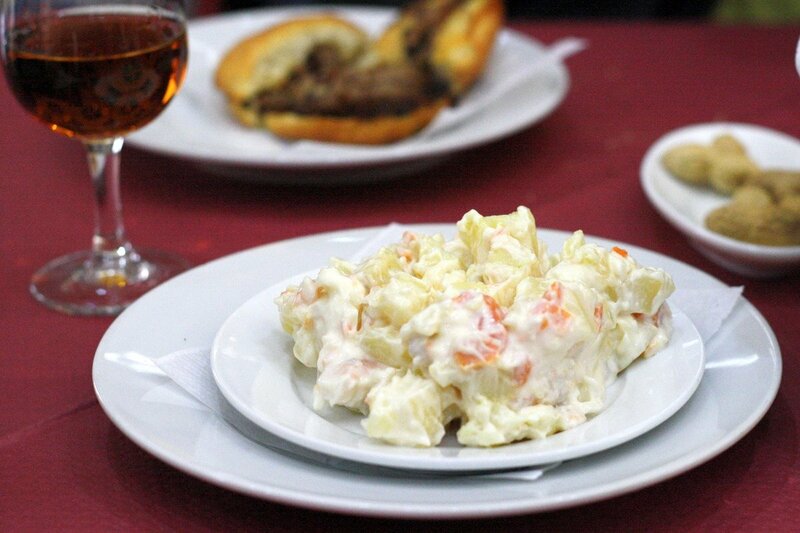 One of the Seville’s most traditional small tapas bars, here you’ll find delicious salmorejo and plenty of montaditos. The tiny space is decorated with April Fair memorabilia, and you can even order a rebujito (a mix of sherry and sprite served at the Feria). An eclectic space that focuses on top quality ingredients (many of which are organic) this is a restaurant– no tapas. But it’s well worth it to bypass the small plates for an evening of ConTenedor’s delicacies. Try their duck rice– it’s life changing. Hidden away in Triana’s ceramics district, the classic spot is known for its delicious and simple tapas, including marinated vegetables such as radishes, carrots, and peppers. For hot plates try their punta de solomillo (grilled pork skewered atop bread) and their chipirones a la plancha (grilled cuttlefish). Their mushrooms with alioli are also delicious! 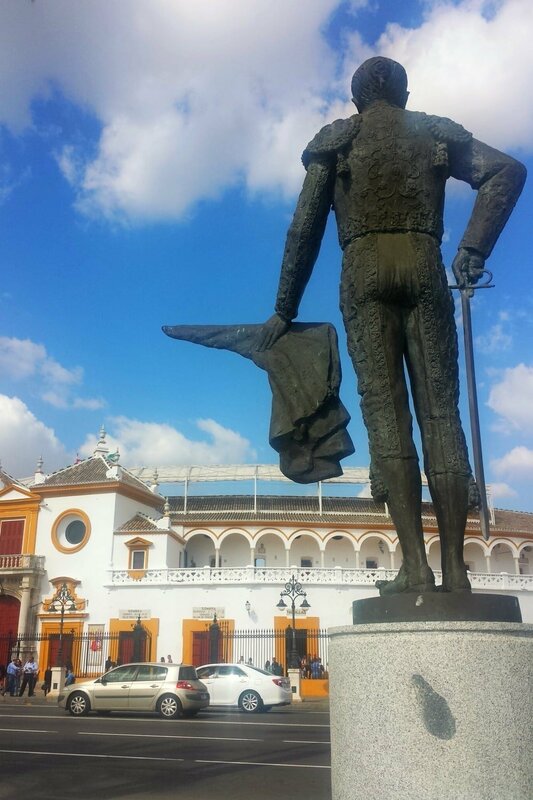 One of Seville’s most beautiful and historic markets is just over the Triana bridge. A stroll through its colorful booths is a must, and if you’re lucky enough to have access to a kitchen while visiting, you will certainly be tempted to buy the fresh fish, meats and spices for sale. Luckily if you don’t have time to cook, there are various bars inside the market that will do the difficult work for you. A classic Seville restaurant and tapas bar, and one of the first in the city to add a modern touch to their menu. Owner Enrique and his son Javier are almost always there to greet you, and the service is outstanding! The plates offered here are inventive, and often touch on Andalusia’s Moorish past. If available, their lamb and date skewer (pincho de cordero con dátiles) and ajo blanco soup are both excellent choices. We now visit Enrique Becerra on our Seville Tapas Tour— join us! One of Seville’s many abacerias (part grocery store part bar), this spot is easy to brush off as a tiny store from the outside. But hidden in the back is a narrow bar where people squeeze in for a sherry and a tapa. Their montaditos are among the city’s best. 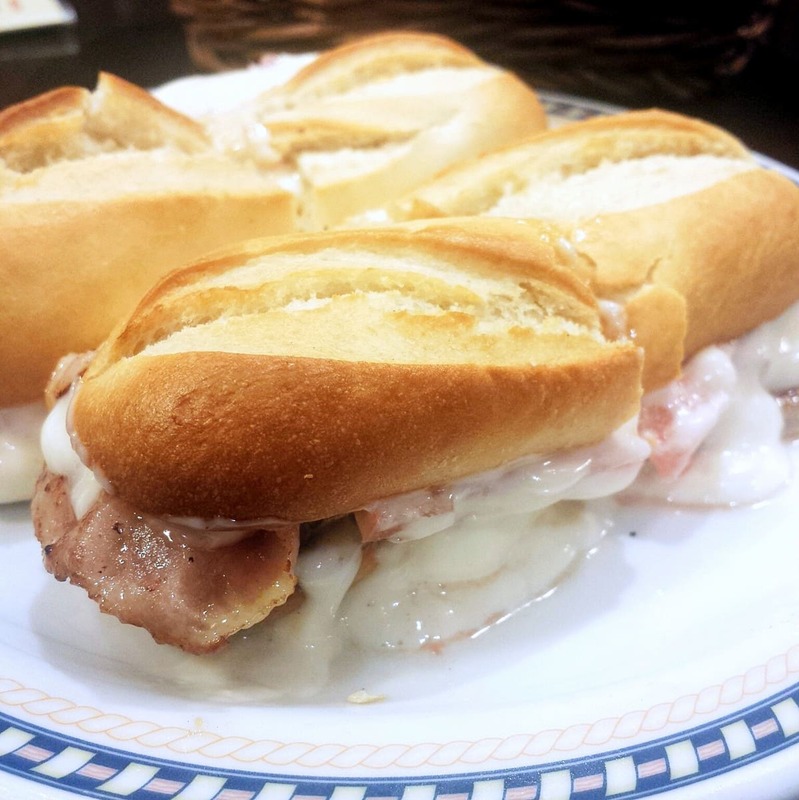 Yummy montaditos at Casa Moreno. This is my favorite old fashioned bar in Seville, and entering inside feels like you’ve traveled back in time. It was opened in 1850 and was a place to enjoy little more than a glass of wine. There are two halves to the space, and I much prefer the part surrounded by old wine barrels called tinajas. Seville is famous for fried fish, and my favorite comes from La Isla. Family run since 1938, they get their seasoning and marinades right. They also do delicious calamares del campo. This is a no frills kind of place that is self-service, and perfect for an informal lunch. 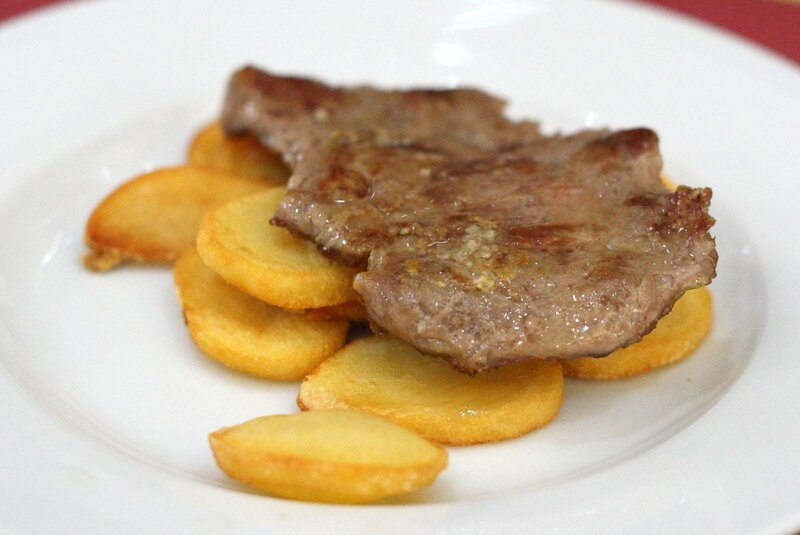 We visit on our Seville food tours to taste their famous cazón! Delicious fried fish and veggies at La Isla. Juanlu and his small team execute delicious tapas in an inviting space. They don’t accept reservations, so get there early! They also offer nearly 100 wines by the glass– an incredible selection in a city where many bars have only a handful of options! The oldest bar in Seville (founded in 1670!) El Rinconcillo is a can’t miss. I prefer it for a pre-dinner apertif, preferably a sherry and some olives. You’ll feel like you’ve gone back in time (despite the tourists and locals crowded in beside you). Another of Seville’s best traditional tapas bars, Maria and Miguel run La Taberna, a friendly and wildly popular place– so squeeze in and don’t be shy. Maria’s rice of the day tapa is delicious, as is her skewer of grilled grouper and vegetables (among many other things!). If you are craving some different flavors, try the Peruvian-Japanese flavors offered at Nazca. Their ceviches come in tapas portions and are absolutely delicious, with a spicy kick not often found in Spain. No visit to Seville is complete without popping in to Bar Blanco Cerillo. Locals don’t often even know the name of this place– they just know the smell of freshly friend anchovies that hits them as they make their way through Seville’s shopping district. A cold manzanilla and a tapa of boquerones fritos is a must! 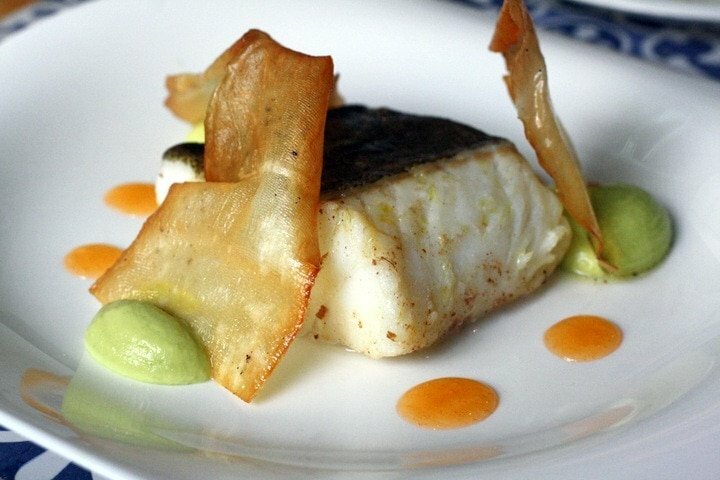 Simple and delicious– boquerones fritos and manzanilla. Hands down the city’s best ice cream, owner Joaquin is a master of his craft. His flavors are seasonal and include traditional Seville flavors like orange blossom and torrijas. A must for any ice cream lover. 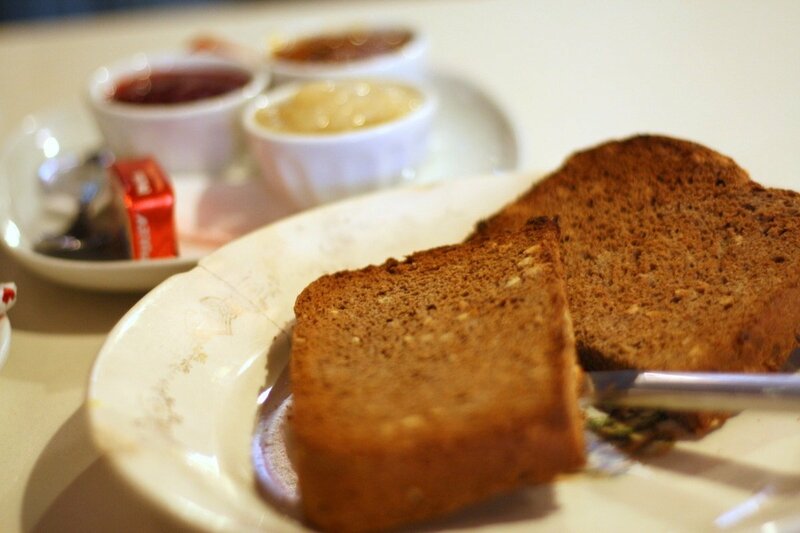 A bread and cutlery charge is often added to the bill and ranges between 1€ or less per table, to 2€ per person, depending on the place. If you don’t want bread brought to the table, specify sin pan por favor, though unfortunately sometimes you’ll still be charged. Feel free to complain if this is the case, though the easiest thing to do is to eat like a Spaniard and enjoy your bread! Don’t take offense when waiters are running around and slam down your drink– it’s not rude, just a part of the show they put on! You often have to be assertive to get a waiter’s attention– feel free to signal him/her over. This is not rude. Don’t expect to be asked if you want a second drink, more food, the cheque etc. Just be assertive and ask! You aren’t required to tip in Seville, but rounding up the bill and leaving up to 10% for excellent service is definitely appreciated (I always tip my servers). Waiters work hard and earn a very low monthly wage. BYOT– bring you own toilet paper! Seville’s best tapas bars get busy and the bathrooms often lack toilet paper– especially in the ladies rooms. Go prepared with a pack of tissues to be safe. Seville is definitely among Spain’s best food cities. The combination of traditional and modern is one of the best I’ve ever experienced, and value for money is unbeatable. Working in Seville to set up our new food tours has been pure temptation to simply move back– and we might really consider it! For now (luckily) I have Ale’s family and many friends there, and am at least able to split my time! Waiting for guests as I give our new Seville food tour. If you are planning to visit Seville we’d love to have you join one of our Seville food tours or Seville tapas tours. The tours are about four hour experiences where you’ll try 10+ different foods at variety of traditional family run establishments. 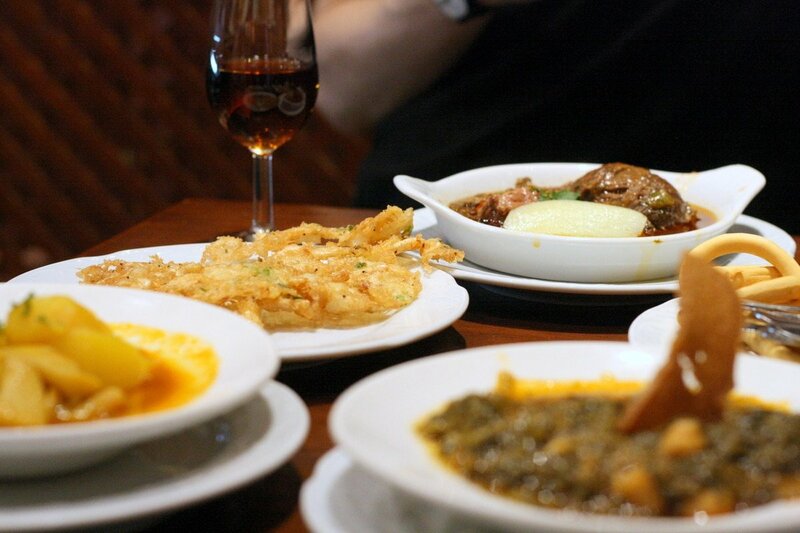 Between bites, you will learn plenty about Seville’s incredible history and culinary identity. Both are super fun tours (and I’m not just saying that because I helped design it!). They really capture the essence of traditional Seville, and they’ve been created, tried and tested by born-and-bred Sevillanos too! You can reserve spots online here: book Seville food tour. 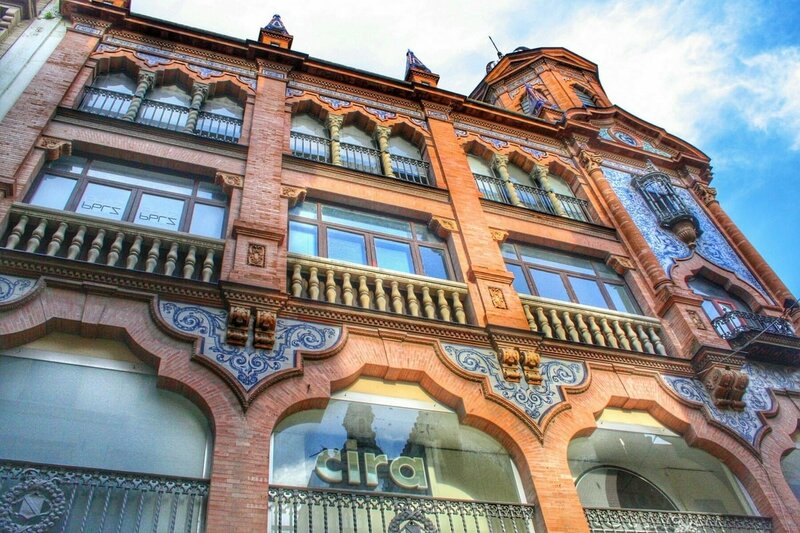 Luckily during most of the year, you are spoiled for choice when staying in Seville. The city is filled with lovely hotels, some even housed in former palaces! I’ve stayed in my fair share of Seville’s hotels these past two years, and there are a couple that have really stood out. For boutique luxury in Seville, I’d strongly recommend the Alma Sevilla Palacio de Villapanes and also the Hotel Corral del Rey. Both are extremely well located, and are gorgeously renovated former Andalusian palacios. Here are my reviews of Alma Sevilla and Corral del Rey. If you are looking for something different, there are plenty more options. You can find some great deals in the area around the Museo de Bellas Artes, and also if you cross the bridge into the famous Triana neighborhood. One thing you want to make sure of, is that your hotel in Seville has air conditioning and heating. Seville can be extremely hot most of the year, and is surprisingly cold (due to the humidity) in winter. 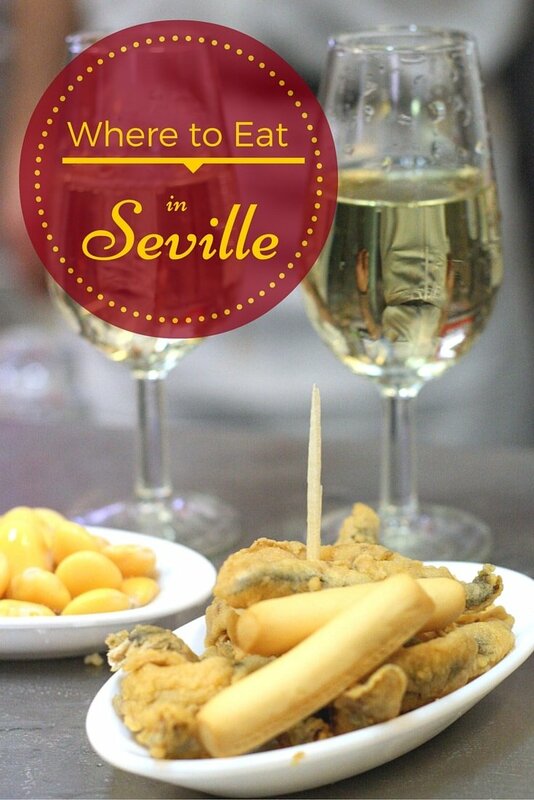 And if you have more tips for eating and drinking in Seville (which is really the important thing to do in this city! ), please leave them in the comments! And if you’ve been– where (and what!) did you try? A truly monumental post, Lauren!!! I wish I had had this post when I visited Sevilla two years ago—but thankfully I’m going back in June so I will have a chance to check out your recommendations. Thanks so much for providing this free resource online! Yay! So happy you’ll be back in Seville– the food is just so good! Awesome article, and the pics are great! We can’t wait to go back to Seville and try some of these places. You would love them! We need to make an eating date one of these days! Bang-up job! I’ve still got many of these on my list, but you’ve mentioned loads of my favorites! And thank you for your awesome help and suggestions in tour planning too! Delicious! Fantastic post. Great pics! Why don’t you have this as a downloadable pdf for your subscribers? This made miss the food (and beverages!) of southern Spain so much! I guess that just means I’ll have to return… And now I’ll have a great resource specifically for Sevilla. I didn’t realize you’d left! Come back soon! This is one of the best articles I have seen written on Spanish food, specifically tapas. I am glad you included Contenedor on your list; in a few weeks it will be our 3rd time in 6 months to visit there. I have been living in Jerez for 3 years and only now, thanks to your article, do I know the differences in these pork tapa dishes. Your readers should also know that Sevilla boasts at least 2 fantastic Italian restaurants: L’Oca Giuliva and Ostia Antica. Hi Peter– thank you so much for such a nice comment! And thanks for the Italian recommendations, I’ve heard about both but haven’t yet tried either. Next time! Ach – I gained a kilo just READING this! But I’ll be visiting Sevilla in the next few months and I’ll have this with me. Brilliant rundown! Wow! What an amazing post. I have lived in quite a few Spanish cities from San Sebastian, to Granada and Zaragoza and spent many summers in Soria but I still have not made it to Sevilla. This post has me dying to go. What a beautiful guide with amazing pictures. I am definitely saving this post and can’t wait to finally make a trip to Sevilla. My husband’s family is from Soria and while we’ve gotten to know most of Spain he has never spent any time in the South. I lived in Granada for a couple of months so I’m a little more familiar with the South but I can’t wait to spend some time there with him. Thanks again for the amazing post and guide. Thanks Ken! Glad it’s helpful! Fantastically well researched, presented – and photographed article, Lauren. 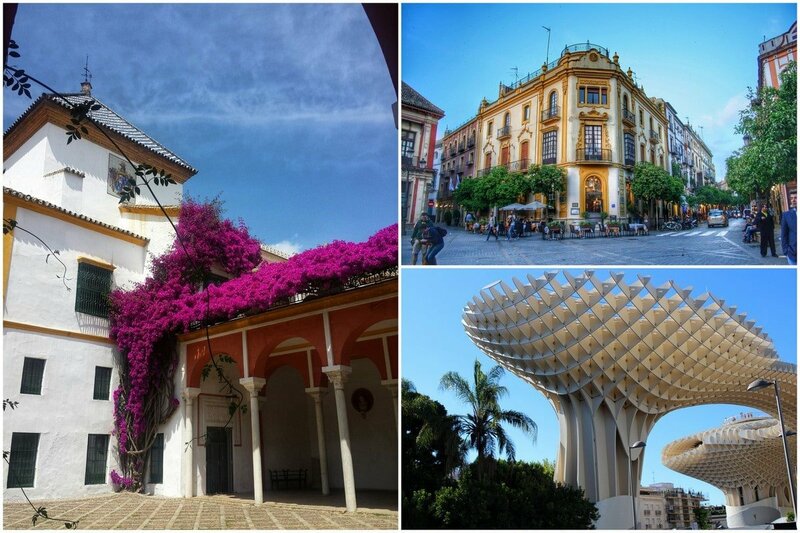 It’s been years since I went to Andalusia and Sevilla in particular – but you sure know how to give a guy itchy feet! The ‘orange’ wine you mentioned, is that Ponche, in a silver looking bottle? Hi! Thanks for the kind words! Not ponche– but now I’ll be looking that up! 🙂 Come back soon! Great practical tips and comprehensive recommendations. So glad May is here so we can finally eat all of this in a few weeks! Stayed at that hotel just above your left shoulder next to the parasol (kept calling it the mushroom for some reason). Really nice rooftop bar up there. Love Seville and Rinconcillo was my favourite bar which is quite close to there too. We did a walking tour with a really nice Polish girl who embraced me warmly when I said I was Scottish. So lovely! Locals call the Metropol Parasol the “setas” aka mushrooms– so there you go! Thank you for this post! I’ll be going back to Seville in August and September so I need to make sure to order sopa de ajo blanco and secreto iberico- looks amazing! Eslava is probably my favorite restaurant in the world- amazing food! Also, I may or may not have smuggled cured ham to the US more than once hehe. My wife and I will be in Seville Sept 25 to Oct 4, how do we arrange a tour and suggestions for an absolutely great dinner while we are visiting? thanks & looking forward to meeting you ! Hi John! It’s hard to go wrong with any of the suggestions on in this guide, but for an extra special dinner I would especially recommend a reservation at ConTenedor, La Azotea, or Petite Comite. All are wonderful for food and ambiance! You can reserve our tour on http://www.devoursevillefoodtours.com. I am Madrid based so will not be leading the tour personally, but all of our guides are extremely passionate about all things food and Spain! Please don’t hesitate to get in touch with any questions and enjoy your stay in my favorite city! Looking for foodie info for our first trip to Seville in August, we stumbled on your blog. Looked great so we booked the tapas/history tour! Can’t wait to enter tapas heaven!! I’m so happy that this was helpful and that you booked the tour! You will have a great time in Seville, and just let me know if you need anything! Do double check with some of the restaurants I’ve recommended, however, as some may have holiday hours. Such a great blog! Really made me reminisce about studying abroad in the most amazing city in Spain! Cruz Campos wasn’t bad and the Food was Amazing! Missing the coffee and the best orange juice. A place I reccomend is Bodegon Alfonso XII! That’s where I had amazing cafe con leche and great lunch as well. I stopped by there every morning on my way to the University and ate there a couple of times. Yes! I’ve had breakfast there many times. Very rustic, but yummy and authentic! Thanks! I used this info when I was in Seville a couple months ago, and it was great! I have a friend going and I’ve been racking my brain to find a particular place that I really enjoyed. It was a random tapas place on a main street in Triana (Las Palmas de Gran Canaria?). They had a montadito I can’t get out of my mind! It had mackerel and salmorejo, and possibly some kind of cheese? It’s a shot in the dark, but figured I’d ask a tapas expert! Aghh, I wish I could help! I’m not sure, unfortunately. Suerte! Your blog has been our indispensible Bible on our first trip to Seville. The first of many i expect. Your guide to mealtimes (!) And the Seville tapas guide are essential reading and add hugely to the Seville experience. This makes me so happy to read! I hope you LOVED Seville– I sure do! Brilliant post! I am going to Seville in 3 weeks for a conference and cannot wait to try all visit all the places!! I’m preparing now for next month’s trip to Spain. I’ll be in Sevilla three nights, so I’m hoping to do a tapas crawl each of the three nights. This guide will be invaluable. I went to a few of these places in October 2016, some because of the Devour Food Tour, and one (Casa Morales) that I discovered on my own (because it was near my hotel). Your blog is fantastic! I’m using it for advice all over Spain. Question: I’m going to be celebrating my birthday in Seville (first time there). Would you recommend Restaurante Oriza or Abades Triana for a special occasion dinner with my husband? From reviews, Oriza seems more consistent with quality food, but Abades Triana sounds like a more beautiful and romantic setting (with very mixed reviews about the quality of the food and service). Thanks! I haven’t dined in either so tough to say — though I have had a drink at Abades, which was nice. I personally wouldn’t celebrate my birthday meal there though, it’s a touch corporate and cold. A drink there would be perfect before or after dinner instead. I just took a look at Oriza’s reviews and I honestly wouldn’t go there either. For me, the food quality is paramount. I might try La Mechela, which is just formal enough to feel “birthday special” and you can reserve. The food is great. Eslava might also be a nice option. Hope you enjoy it no matter where you end up! Thanks for the advice! Maybe we’ll just do drinks at Abades, then.